Not far after entering the Kruger National Park , a tourist couple recently came upon a very unusual ‘battle at Kruger’: a leopard was stalking a three-meter long python. 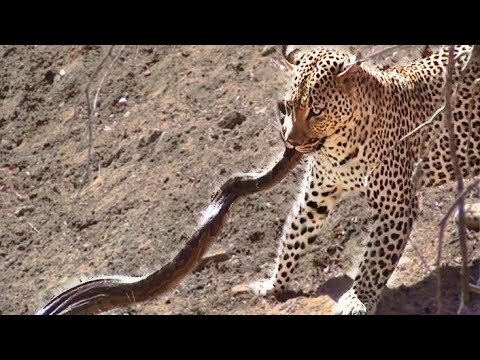 The leopard planned its attack for several minutes and then bit the huge reptile in its thick neck, just behind the head. After a few minutes of biting, hissing and curling, the snake was able to shake off its enemy and escape into a nearby waterhole, leaving the leopard in confusion and desperation behind. When returning to the scene a few hours later, the tourists found the leopard in a tree near the water where the battle was earlier that day. It was eating something and a piece fell down from the tree. According to one of the tourist, it looked like a snake’s head…..